After a six-month uptrend, the Global Precious Monthly Metals Index finally succumbed to a cooldown in April. Every single constituent metal price comprising the Global Precious MMI basket - 14 in all - fell this month. The supply market for palladium is still as tight as we reported last month. After a scorching six-month uptrend, the Global Precious Monthly Metals Index (MMI) couldn't get any hotter even as spring officially came around the corner, finally succumbing to a cooldown in April. The subindex tracking a basket of gold, silver, platinum and palladium prices from four different geographies dropped three points to 95 for the April reading - a 3.1% decrease - driven by a drop in palladium and platinum prices. Even though the U.S. palladium price has cooled off a bit to begin the month of April, this marks the third month in a row it has traded higher than the gold price (even though the spread is a bit tighter). As tracked by the MetalMiner IndX, the U.S. palladium bar price stood at $1,401 per ounce on April 1, an 8% drop from March 1. In fact, every single constituent metal price comprising the Global Precious MMI basket - 14 in all - fell this month. According to a recent Kitco News report, BMO Capital Markets has "hiked their forecast for palladium sharply, looking for it to remain underpinned by a tight supply-demand picture and maintain a large price premium over sister metal platinum for the foreseeable future." The report states BMO "upped its average price forecast for palladium by 45% to $1,612.50 an ounce this year and upped its 2020 outlook by 11.3% to $1,112.50." 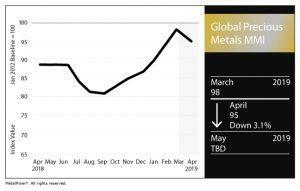 "As the premium over platinum continues to hit new records, there can be no doubt palladium is in a heavy market deficit at present amid stagnant supply and higher catalyst loadings for gasoline vehicles," said BMO, as quoted by Allen Sykora of Kitco News. "And with substitution being a slow burn rather than an immediate fix, there remains decent potential for further upside. Qualifying a new catalyst is an expensive and time-consuming process, and we would expect this to occur only when the next range of vehicle models emerges." Sykora goes on to report "the bank figures that substitution to platinum will eventually occur, thus 2019 will be the peak for palladium prices." How tight is the supply market for palladium? Still as tight as we reported last month. "The market is still fundamentally tight," said Philip Newman, of the Metals Focus consultancy, as quoted by Reuters. In addition, the consultancy forecasts a 789,000-ounce shortfall this year in the 10 million ounce-a-year palladium market - and deficits of a similar size for several years after that, Reuters reported. "Once the dust settles [on this latest downward blip for palladium], prices will start to recover," he is quoted as saying. Expect palladium prices to be relatively well-supported in the long term (over the next 6-12 months or so), if this supply strain continues.